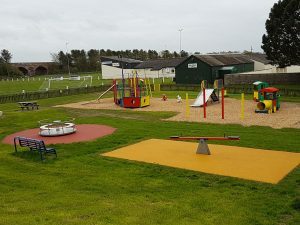 Silloth Town Council are responsible for two children’s play areas and a Water Splash pad which are looked after by the Council’s grounds maintenance team. These are inspected regularly to ensure that they are clean and safe. However, if you find a problem with any of the play areas you can tell us by completing our online form. The Eden Street play area is located within the Eden Street sports area. There are various items of play equipment catering for various ages, with ample seating and picnic tables available. There’s plenty of space for children to let off steam. Our Children’s Play Area is a firm favourite with the kids! For more info click here. Situated on the Green, the modern waterplay area replaced the former paddling pool. The Water Splash Pad is a huge hit with youngsters, whose screams of delight can be heard throughout the summer. Parents and children can enjoy a picnic at the solid oak picnic tables next to the splash pad. For more info click here. 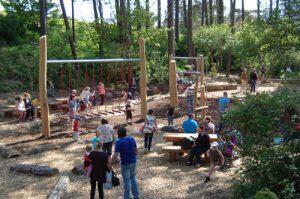 Complementing the ‘splashpad’, a woodland timber play area was constructed amid the pine trees which provides a welcome recreation area for older children. Again, the area has a number of oak tables for family picnics. For more info click here. Young people in Silloth were instrumental in preparing a proposal to build a BMX Track on Silloth Green. They have taken a responsible approach that has been admired by the whole community. 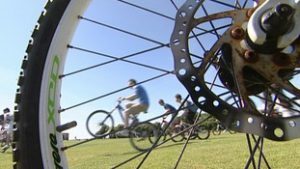 The proposal has been supported by the Heritage Lottery and Silloth Town Council, with the new BMX Track opened in December 2013. For more info click here.